Visitors to Asia Fruit Logistica 2018 can bring fruit samples to the TOMRA Food and Compac ‘Fruit Sensing Lab’ at booth 5E28. At The lab visitors can discover in-depth information regarding the internal and external quality and characteristics of each fruit using the latest sensor technologies. Everyone has heard the expression ‘one bad apple spoils the bunch’, but in today’s consumer driven world of choice, one bad apple can cause much greater damage by spoiling the brand. That’s why the top priority of fresh produce brands is guaranteeing a consistent eating experience for consumers. Each fruit bin from the orchard is different and each geographic market and retailer can have their own unique standards and specifications. State-of-the-art technologies, such as the new Inspectra2, enable accurate inspection of more characteristics to give packhouses the ability to identify the quality of each piece of fruit, pack to the exact tolerances, and ensure customer expectations are met. This increases consumer satisfaction and drives repeat purchases. With over 40 years of experience developing industry-leading sorting solutions, TOMRA Food and Compac hold a special position as the world leader in sensor-based sorting solutions for food, with a team of over 200 research and development engineers. The ‘Fruit Sensing Lab’ makes it easy for visitors to experience state-of-the art sensor technologies used in external and internal inspection systems, including Spectrim and Inspectra2. Visitors who bring a piece of fruit to the lab can receive a detailed report on the characteristics and quality of that fruit, demonstrating the power and possibilities of today’s advanced grading platforms. The inspections will reveal more characteristics about the fruit than what is possible with older technology, for example, sweetness level, internal defects, storage capability, and hard-to-see subtle external defects. 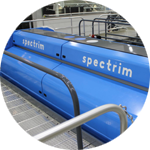 The award-winning Spectrim platform is the most powerful external grading platform available to the fresh produce industry. Spectrim’s ability to reduce cost-per-pack while increasing the consistency of quality of pack is vital for packhouses. System and software demonstrations will be available. Launched at Fruit Logistica 2018, Inspectra2 uses a NIR spectrometer to measure the internal properties of fresh produce, minimizing supply chain losses and ensuring a quality eating experience for consumers. Test the internal quality of your fruit at the ‘Fruit Sensing Lab’. The 21st century is about convenience, which has seen a rapid increase in pre-packed and branded produce. Consumers need to know that every time they purchase a bag of apples or citrus, whether from a supermarket or online platform, each fruit will be appealing and delicious. Providing a consistent eating experience to consumers is at the heart each TOMRA Food and Compac solution. Bring a piece of your produce to the ‘Fruit Sensing Lab’ at booth 5E28 and see how the latest technology can protect and enhance your brand.